Members of the CFB Esquimalt Tritons gather for a victory photograph following their 5-4 win over CFB Edmonton in the championship game of the Canada West Regional hockey tournament in Wainwright, AB, on Feb. 1. The Esquimalt Tritons rallied to defeat CFB Edmonton and capture this year’s Canada West Regional Men’s Hockey title in Wainwright, Alberta, on Feb. 1. The winning goal came from Lieutenant (Navy) Edric Lim, a Logistics Officer from HMCS Ottawa, with five minutes remaining in the third period that gave the Tritons a 5-4 victory in the championship game of the five-team tournament. The Tritons dropped their opening game to Edmonton 6-4 but then rebounded to reel off five consecutive wins. In their path to the finals they defeated CFB Wainwright 13-2, CFB Winnipeg 7-4, CFB Shilo 9-0 and had a 7-3 triumph over Winnipeg in their semi-final. The Canada West regionals served as a qualifier for this month’s Canadian Armed Forces Men’s Hockey Championship tournament, held Feb. 23 to 28 at CFB Edmonton. The Tritons trailed 4-2 going into the third period of the championship game before erupting for three unanswered goals. Esquimalt’s top scoring line included forwards Lt(N) Lim, Corporal Jon Michel and Captain Jack Lawson who all led the way in the comeback by each scoring one of three goals. Tritons Team Captain, Lt(N) Braden Casper says the victories give him and his teammates a confidence boost and feeling of satisfaction heading into the nationals. 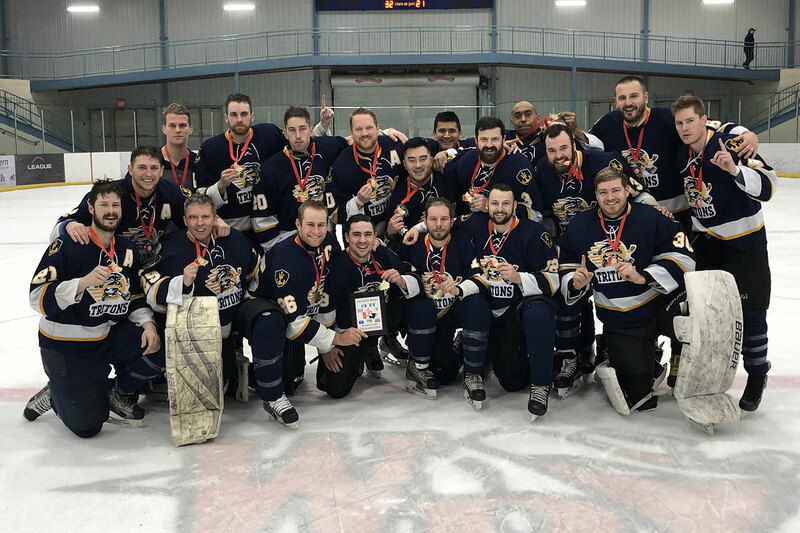 “The team gelled together and over the course of the tournament dug deep to show resilience against some strong competition from Edmonton,” said Lt(N) Casper, who works as a Maritime Systems Engineering Officer aboard Ottawa. Lt(N) Casper noted that historically Esquimalt is normally at a disadvantage when it comes to competing at the nationals. That, he says, is because of the relatively small size of the base compared to other military bases in Eastern Canada and the smaller player pool they draw from is complicated by frequent deployments. “As a group we are more optimistic that we now have a team that can go to the national finals and compete,” he said. Lt(N) Casper congratulated Tritons goaltender Chief Petty Officer Second Class Ken Simoneau of Canadian Fleet Pacific, and forward Lt(N) Jeffrey Brooker a Deck Officer with HMCS Ottawa, for their stellar play throughout the tournament. He says special credit should also go to Capt Jack Lawson who earned Tournament MVP honours.